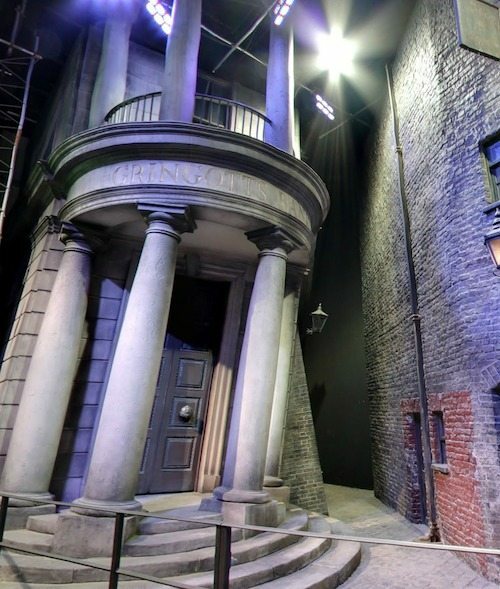 With Diagon Alley opening up in summer 2014 at Universal Studios, I thought we’d have a look at Diagon Alley at The Making of Harry Potter in London to get into the excitement of things. 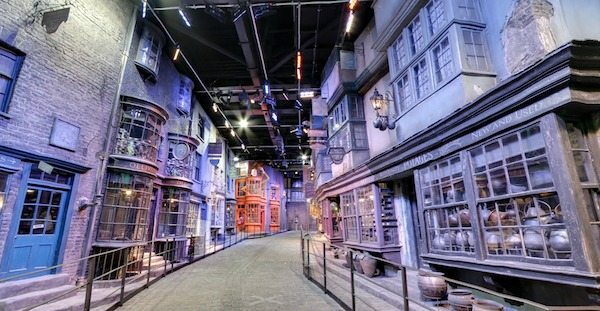 I’m seriously kicking myself I didn’t leave our Orlando trip just those few months more! Oh well, another year. 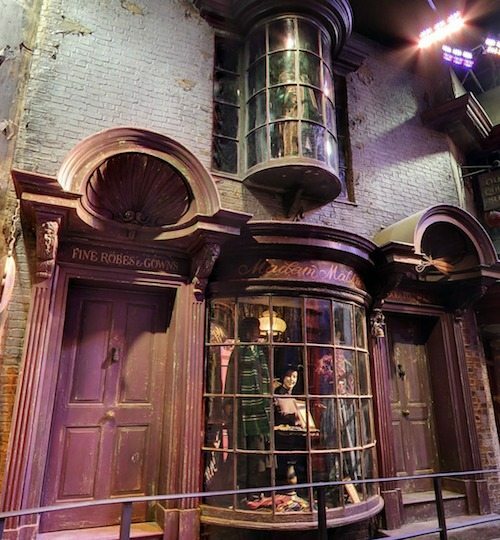 In the meantime, let’s take a wander down Diagon Alley and look in some shop windows. 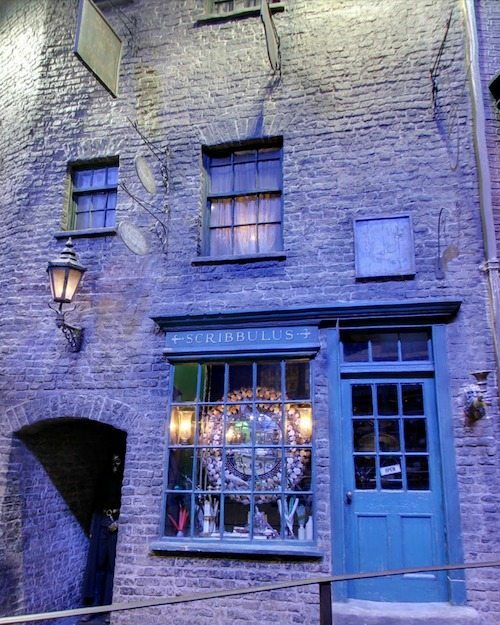 I’m using some snapshots from Google Maps, but have added in some of my own that show a bit more detail from our visit in July 2013. And yes, really, Google Maps. 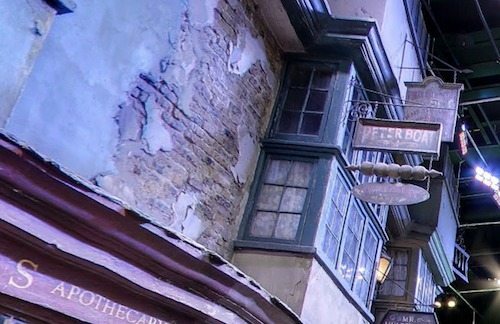 You can walk down Diagon Alley on Google maps on your own and explore the street! 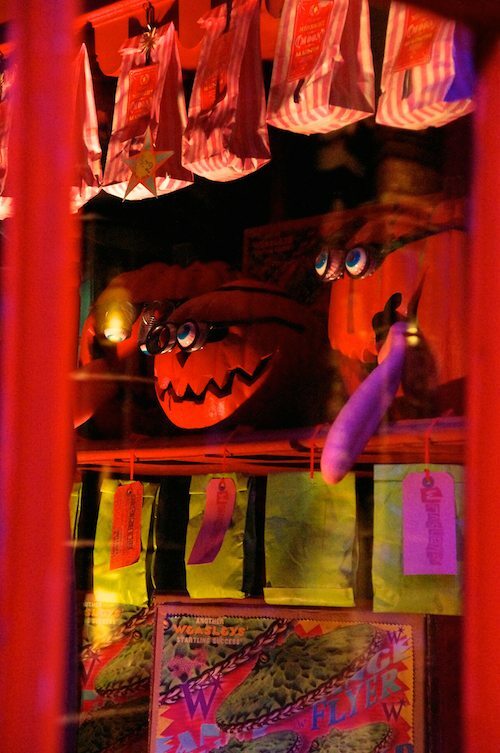 You know, just in case you’re feeling a little homesick. 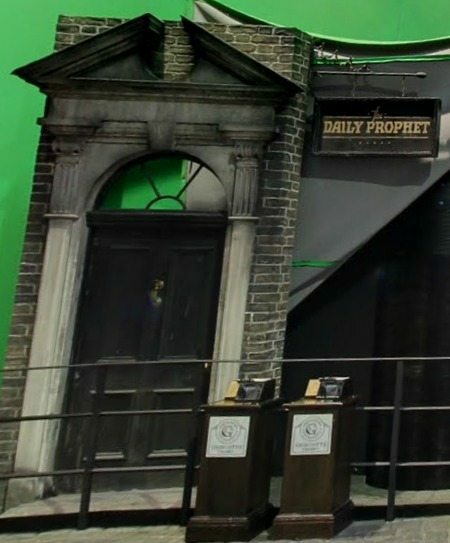 When we first walk in (you come in from the special effects department), you’ve got The Daily Prophet’s office to your left, Gringotts Wizarding Bank straight ahead and Potage’s Cauldron Shop. 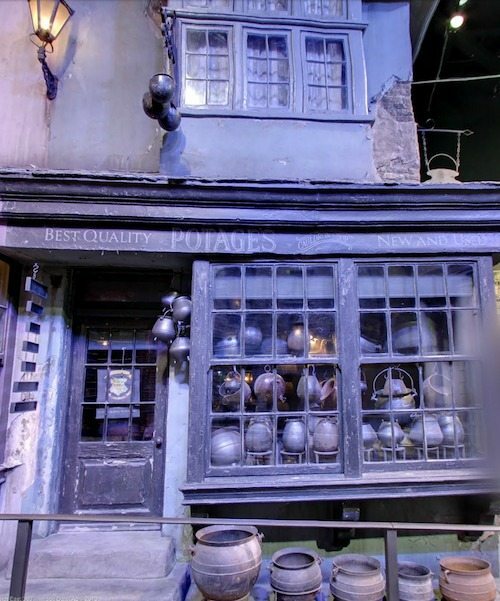 Potages, where Harry bought his first cauldron. 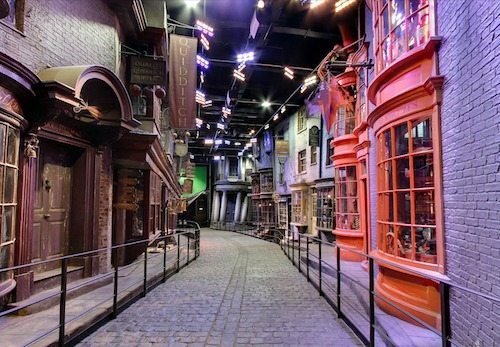 Turn right and you’re on the main strip. To make this easy, let’s go up one side (the left) and then up the other. 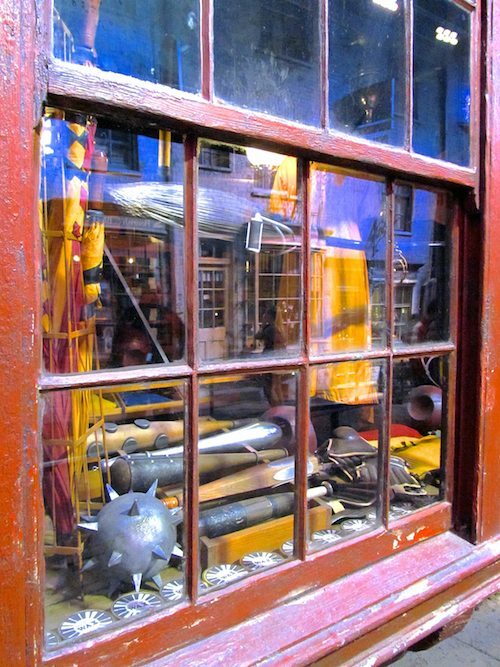 Scribbulus Writing Instruments – sells stationary for wizards. Your usual things, ink, quills, parchment paper. 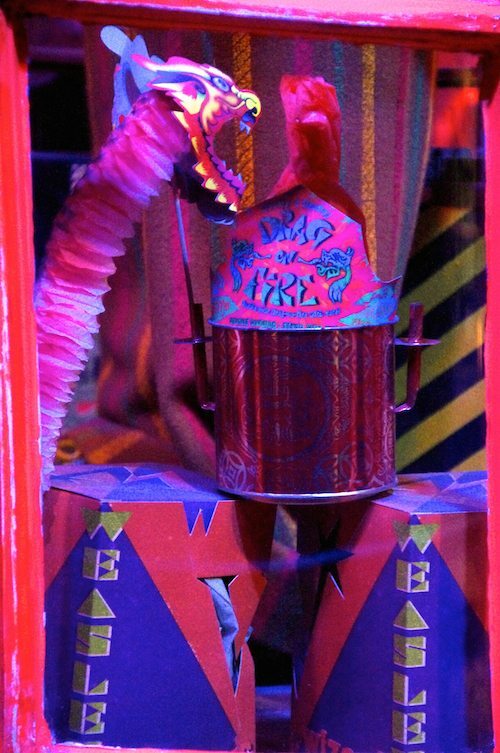 Wiseacre’s Wizarding Equipment- sells telescopes, hourglasses and other instruments. 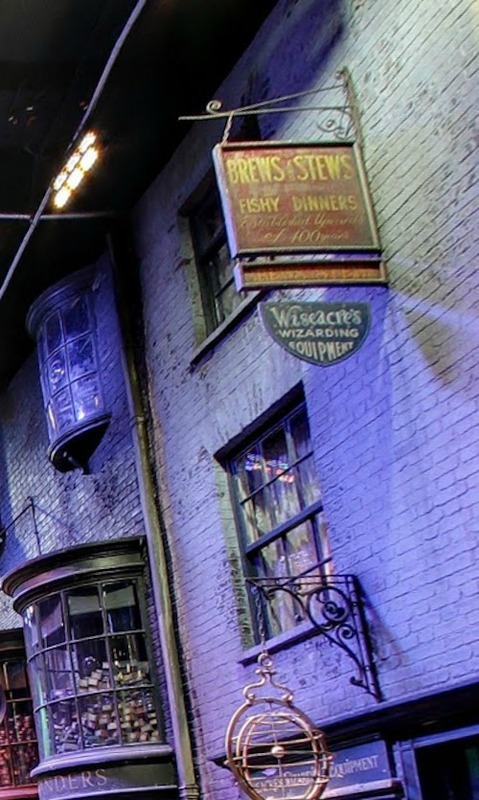 Above Wiseacre’s, you’ll find the sign for Brews and Stews, which, according to Harry Potter Wiki, is a hostel for wizards that travel into Diagon Alley and need a place to stay. Florian Fortescue’s Ice Cream Parlour. Don’t worry! His recipe for strawberry and peanut butter ice cream is coming! 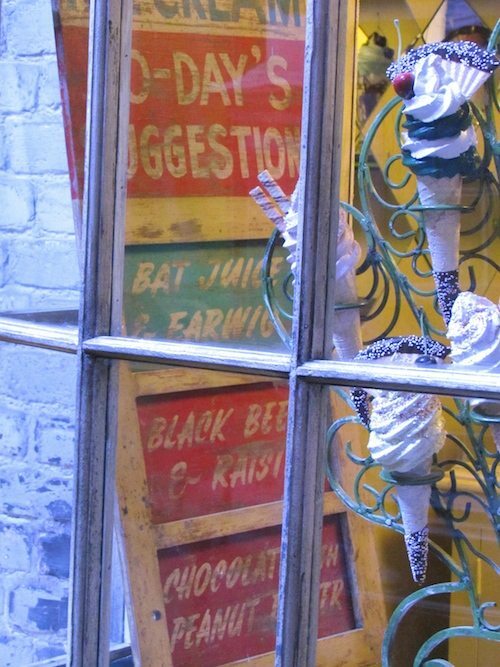 But have a peek at the sign inside… there’s Bat Juice and Earwig ice cream (any takers?) or the Black Beer and Raisin flavoured ice cream. 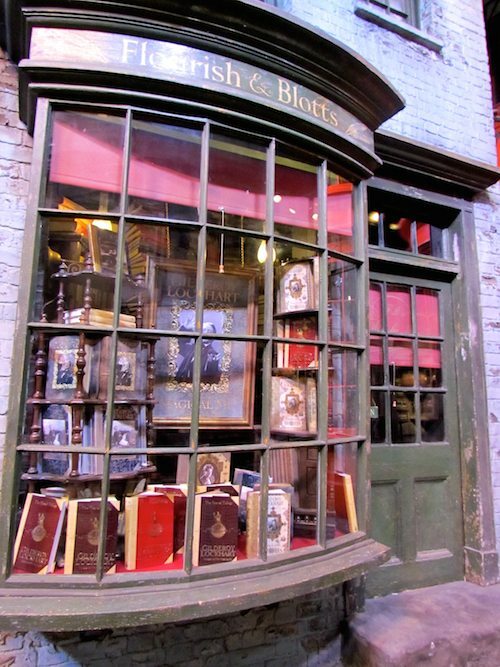 Flourish & Blotts, the bookstore in Diagon Alley, with its window filled with Lockhart books. Ok, that’s one side done. 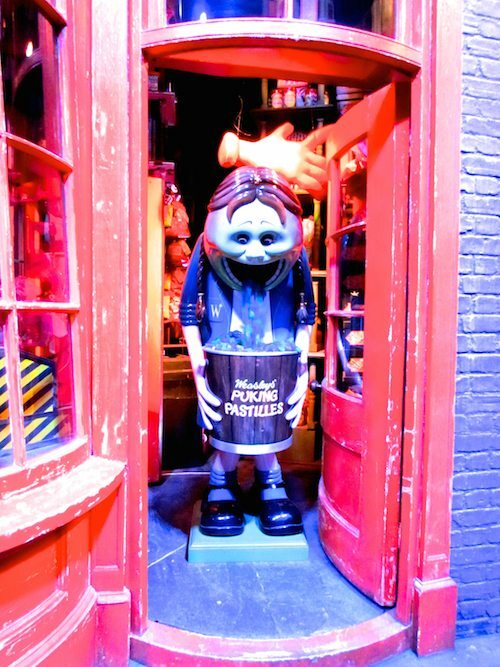 Let’s turn around, back back to the bottom and go up the other side starting next to Potage’s Cauldron Shop. 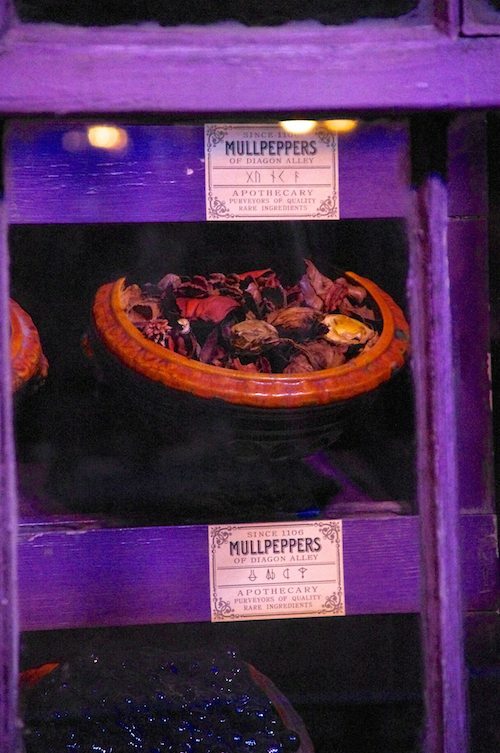 Mr. Mullpepper’s Apothecary- sells potion ingredients–Fluxweed, Knotgrass, Valeria, Borage, Fireball Eggs, Dried Asphodel as well as other bowls with signs written in an ancient lettering. 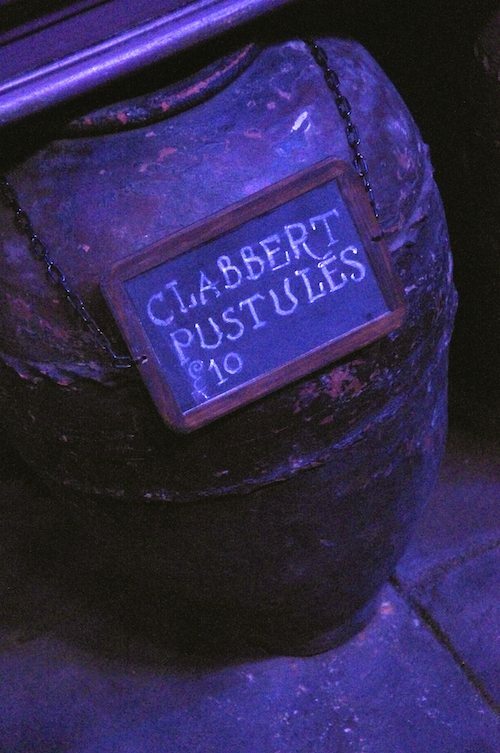 Large jars outside have signs advertising Clabbert Pustules, Dragon Liver, and Chizpurfle Fangs. 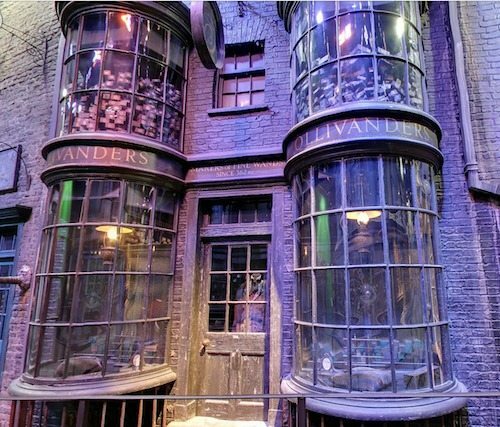 And they make it clear, no, they don’t sell unicorn blood. 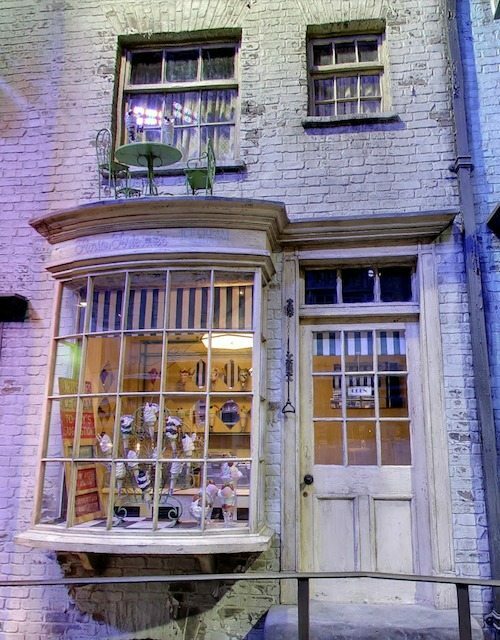 Above Mr Mullpepper’s is Peter Boat (Harry Potter Wiki helping out with my research here) a store that sells rope and twine. 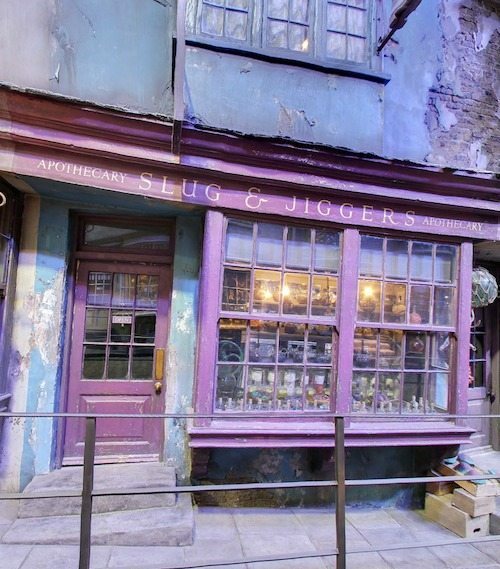 Next to Mr. Mullpepper’s is another Apothecary, Slug & Jiggers Apothecary. 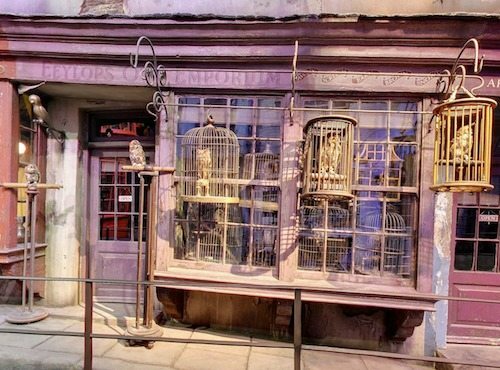 Eeylops Owl Emporium sold owls (Hedwig was bought here) and owl supplies. 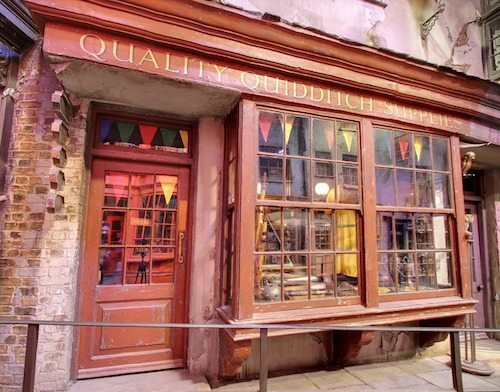 Quality Quiddich Supplies naturally sells Quiddich equipment including robes and broomsticks. 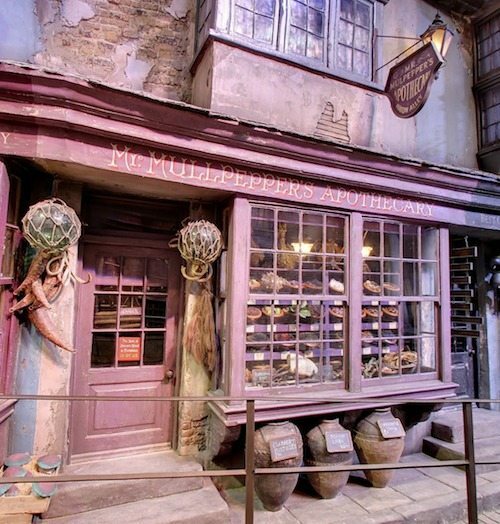 Madam Malkin’s Robes For All Occasions sells the uniform robes for Hogwarts as well as dress robes and so on. 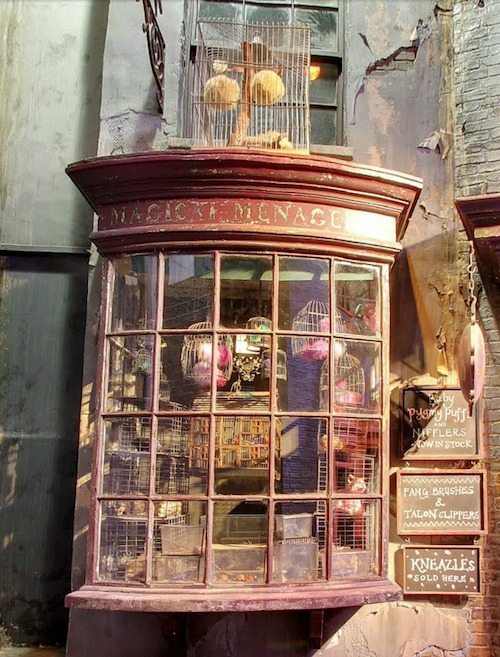 The final store is Magical Menagerie, where students often bought pets and pet supplies (they’re advertising fang brushes and talon clippers). 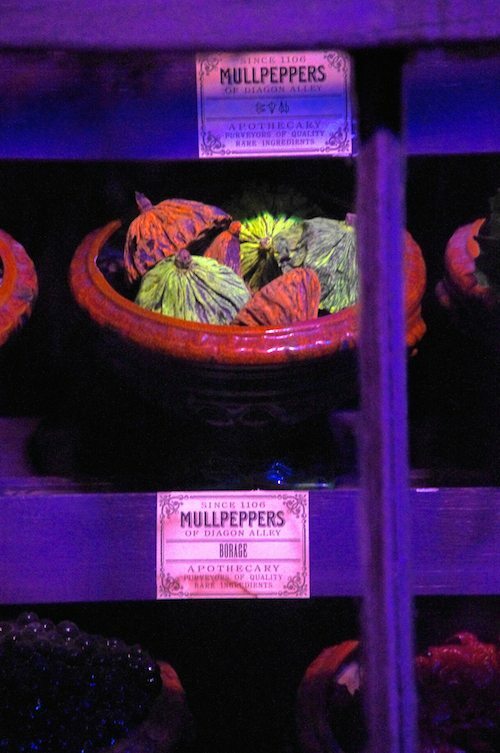 You can see by the signage that they stock Pygmy Puffs — you can see them in the window, the pink balls of fluff. 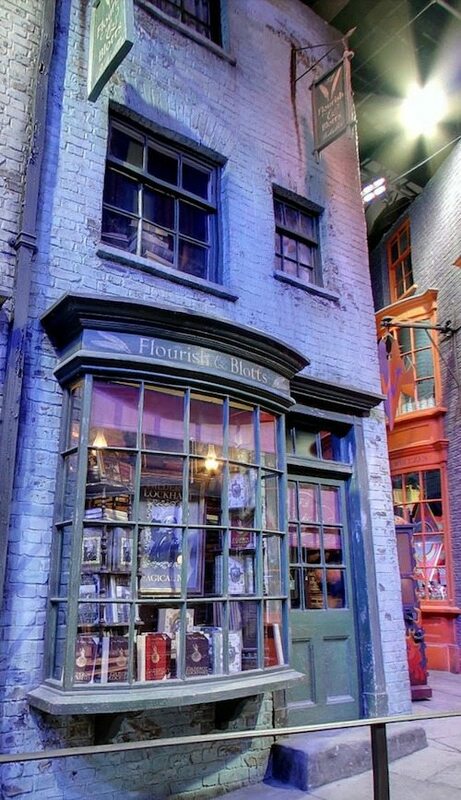 From what I can tell, the golden fluffy puffs up on the top bit of the store might be Puffskeins (Pygmy Puffs are the mini size). 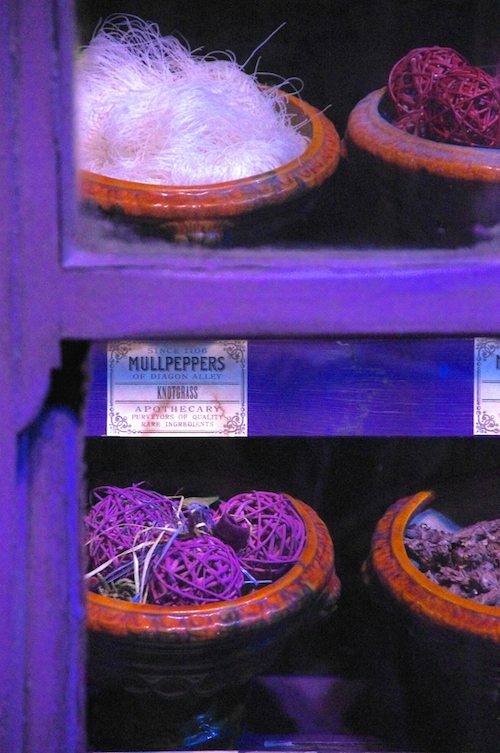 Nifflers are also sold — remember that Hagrid introduced these in one of his classes. They’re treasure hunters since they love shiny things! 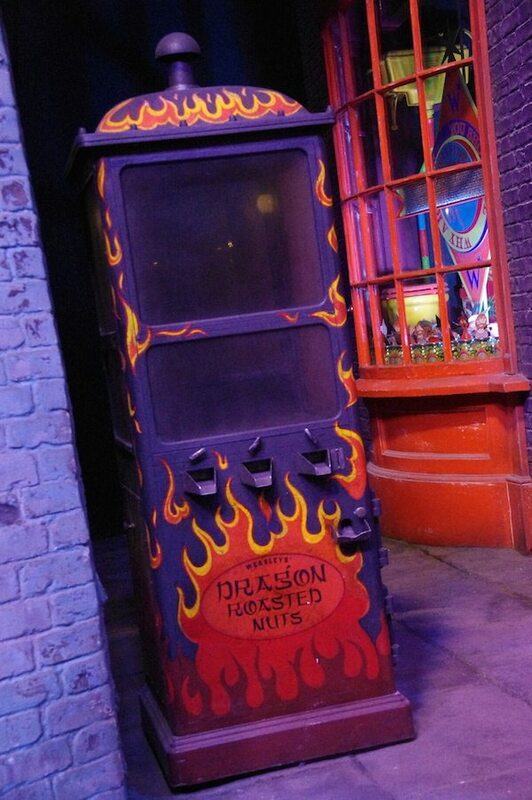 And you’ll also find Kneazles for sale. 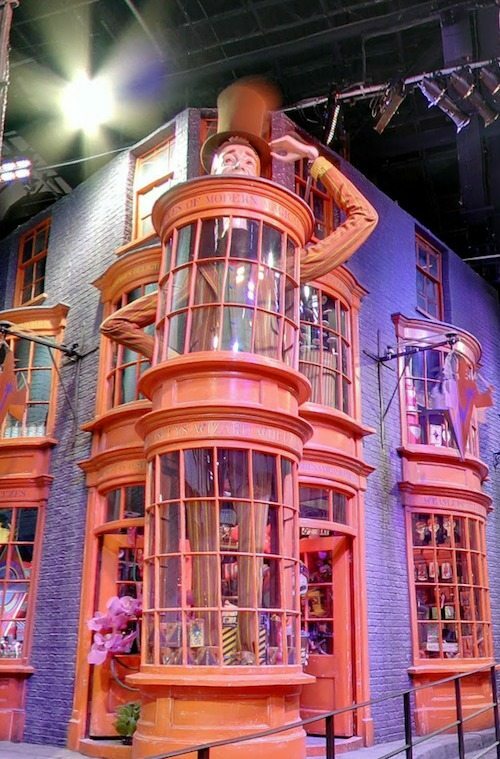 Crookshanks is apparently half-Kneazle.